Some days ago I released a new Dynamics CRM tool called Dependent OptionSet Generator. As the name suggests it helps to create and update dependent OptionSets, one of the possible approaches to filter data inside CRM UI. Scott Durow wrote an overview about this argument on his blog: "Option-Set, Lookup or Autocomplete", it's very useful if you plan to use dependent OptionSets in order to know the pro and cons of this approach. I want to thank Scott not only for his post but because he found the time to meet me when I was in London a couple of months ago (photo). He was the first person I talked about this little project and we had a pleasant discussion not only about Dynamics CRM, thanks again Scott! 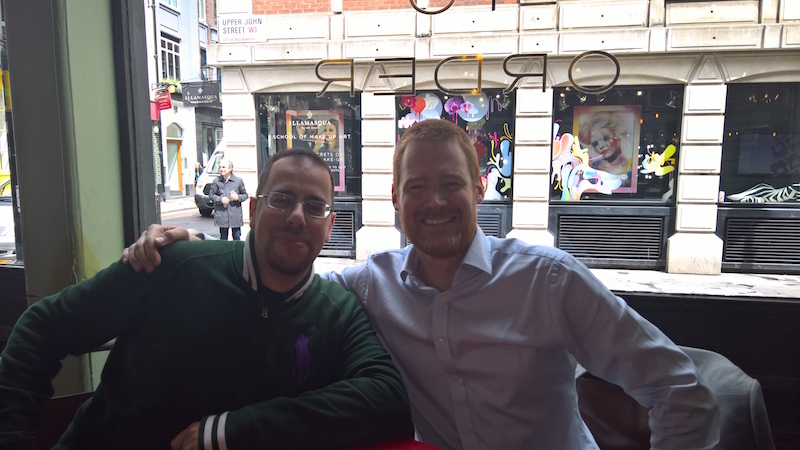 During my short visit in London I also met again Ramón Tébar Bueno and it's really nice to spend some time with other members of the Dynamics CRM Community, plus he took me to a typical British Pub! Now back to the main reason of this post, the Dependent OptionSet Generator. Starting from CRM 2011 the possibility to filter OptionSets entries was available thanks to the Xrm supported methods. Microsoft also provided a solution inside their CRM SDK to implement the dependent OptionSets but the most tedious process, the generation of the XML file required to map the entries, was delegated completely to the user. Creating manually the XML document has always been a bummer, especially when you need to deal with several entries, so developers and consultants suggest to use filtered Lookups instead. However there are implementations where OptionSets are preferred due to the Multi-Language support, to facilitate CRM users (at eCraft, the company I work for, we often have customers with Finnish and Swedish users) or because it's required by the law (for example in some provinces of Canada). Microsoft kept updated its Dependent OptionSet solution during the years and with the latest CRM 2016 version they changed the configuration format structure from XML to JSON, probably in order to simplify the creation of the file. This post will cover the first part, I will write another post (or more) regarding the Web Application. Different Namespace: because I didn't change the name of the functions I preferred to use a different namespace (DO instead of SDK) in order to avoid issues if the SDK library and my library are loaded in the same form. in this way old browsers can support JSON methods like JSON.parse. response and responseText: Older versions of Internet Explorer don't implement the response property inside the object returned by the XmlHttpRequest, so if the property is not defined we will use the responseText instead. Making the library compatible with CRM 2011 was more an exercise for me, CRM 2011 is officially not supported and I hope that many instances have been already migrated to newer versions, but I am aware that this is not always possible. However the main part of my solution is the Web Application to create/update the JSON configuration, if you are already using the CRM 2016 SDK Sample in your CRM, you can use the Web Application without using my library and just update the Web Resources.